THE CONVERTORUM: Quis custodiet ipsos custodes? The watchman is more or less done. As usual when I begin to have ambitions the end result doesn't quite live up to what I had imagened. Pretty pleased with the look of the shield on his back though. Very nice as usual... how come it hasn't lived up to your expectations? My only minor quibble would be that the browns you've used on the axe haft kind of make it blend in with aspects of his uniform and gear but I couldnt paint like you to save my life so what do I know! 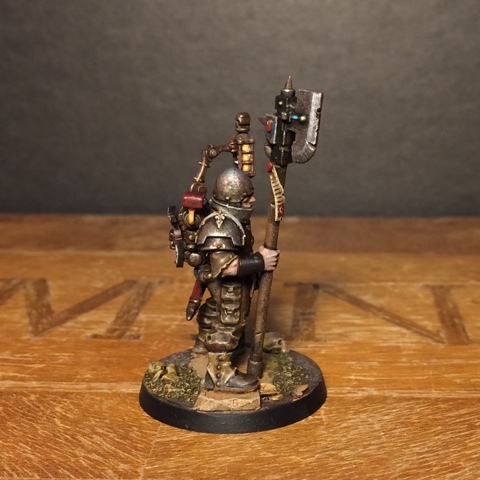 That´s one of the things - I set out to make a more or less completely brown miniature, but still maintaining contrast by keeping the values distinct. In the end it simply came out a bit to uniformly brown. Personally, I don't see a problem! I can see the different browns quite clearly with just enough muted metallics and a few spot colours to break up the overall look. Yeah - I guess it works pretty well. Just came out a bit too grubby that´s all. 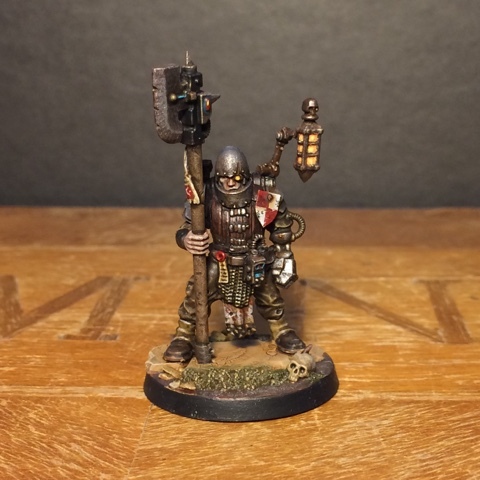 You've done some pretty fantastic conversions, but honestly, this is one of my favorites. I know there's a ton of work in him, but it looks deceptively understated, and the paint is perfect for this subject. Well done. Cheers mate! I was really aiming for a something that looked like a classic metal sculpt. Fantastic looking figure. As for paints drying too fast, I started using a wet palette to combat this. In the Utah summer my paint was drying as fast as I could dip my brush it seemed like. You're just a miracle, master-piece machine aren't you? Aww. You're too good to me! I think you've achieved a pretty good range of browns here, but I agree that you could have taken it a little further. Maybe some glazes on his sleeves to distinguish the color from the pants? I think a greenish-brown would look good, especially to contrast with the red on his shield and knife. They actually are a greenish brown - same as the trousers. But you might be right... Perhaps I should differentiate the sleeves and the pants more. Ah, I saw the pants and sleeves as being a yellow-brown and the vest a red-brown. I like this a lot. The stiff posture seems to imply his kit is holding him upright in some way. Kind of the way a back brace might. Also seems to imply an awkward, clumsy but strong character from his enhancements. I'm having the same problem with some of my older GW paints. I find a good squirt of Vallejo thinner and some vigorous stirring with a paper-clip brings some life back to them. Looks good, I like the way the metallics have come out and the lamp looks even better now that it is painted. Regarding paints, I am having problems with my metallics drying up fairly quickly, they just turn into a sludgy lump at the bottom of the pot? Thanks mate. I mostly use the pigment heavy foundation colours - that might be part of the problem, but it's also the pots themselves. I've got twenty year old citadel paints that still haven't dried out, but in the new pots few paints last more than a year or two. Man, this guy is great! 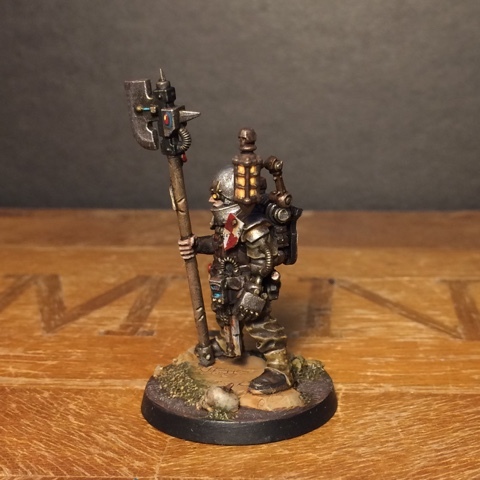 I could see him patrolling some Old Worldian feudal world village as easily as I could place him walking through lower levels of an underhive. Not going to lie, I was a little iffy about the lantern at first but seeing him painted up it really does work wonderfully. While I can see what you mean about the browns I feel the same as everyone else and think they turned out great. There's always room for improvement but in this guys case that room isn't exactly spacious. Cheers! Given the warm reception of the mini I have to consider it it a sucess! if I will not be using a color for a while I put a few drops of water in the pot without mixing or shaking it. Most of the water will sit on top of the paint and it will evaporate first. If you use it and the water is still there you can pour it off easily since the paint is thicker than the water. Not fool proof but it helps. Not as useful with metallics since the pigment sinks. Sad that my GW paints from the early 90s are still good and the ones I bought a couple years ago aren't. The model looks great, I like the monochrome look all the Browns give him. Good tip! Gotta remember to do that. Not sure why this shouldn't have lived up to your expectations. It's a first class conversion and paint job. At the risk of causing offence to GW lovers everywhere, I have the same problem with the current Citadel Paint Range. My solution has been quite simple; I've stopped using them, with the exceptions of a few of the technical and special effects paints. there are better and cheaper paints available online. Namely Vallejo Model and Game Color ranges, P3 and Coat d' Arms (basically GW's original paint line). Failing that, Airbrush Thinners, Flow Improver or Retarder would all conceivably prolong the pot life of your GW paints. Hope this helps and I look forward to seeing more of your conversions very soon. I've use a few Vallejo and Game colours but I find they don't stick to the models quite as well as GW paints. They tend to rub off on raised parts when you handle the mini. I really like the pigment heavy base colours from GW and I suppose that's probably part of the problem - the increased amount of pigment makes the paints dry faster. Jeff, I'm loving this conversion. I can see where you're picking on yourself in terms of contrast, but for me he truly fits a bleak and hopeless feeling and atmosphere that is key to some parts of the Grimdark. In terms of paint, I have found the same problems with Citadel's line, sadly. I've stopped buying all but their washes. Currently I'm using P3 for my brush work, and would recommend them. However, I would also entreat you to look at the Scale 75 line of paints. They have a super matte finish that I think you would really like! I'll check 'em out! Thanks mate! I have the same issue with certain Citadel paints (some more than others) and pretty ubiquitously I just pour a splash of Lahmian Medium in there and give them a shake. Back to as-new imediately. Even if they've turned into thick lumpy mud. This looks great - very classic Rogue Trader vibe about him. 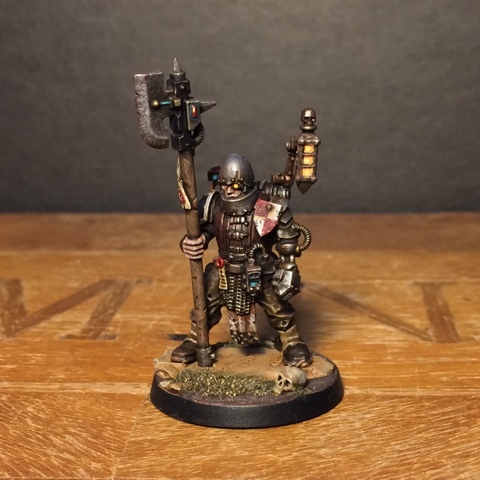 Totally nails the anachronistic weirdness of 40k for me! Perhaps you could do a floating vox-servitor town crier from the same medieval backwater world to accompany him?! Once your paints get a bit chunky, as the GW-range tends to do, I find that a small amount of Tamya's 'X-20A Thinner' does the trick perfectly to break up the paint and make it smooth again. The medium itself is pure alcohol, a mix of n-Propanol and butyl alcohol made for model paints, just remember to add a few drops of water after because the gw-cans are not tightly sealed (thus the drying) and the alcohol will slowly evaporate. Nice, as regards the GW paint, you could try Acrylic retarder it helps and works well with blends. You should also consider other brands as well, the newer GW Paints are a bit hit and miss with drying times. One prefers Wargames Foundry ones as they use a triate system, which works nicely. This gives me inspiration for both my Imperial Guard and my Bretonnians. I love the way you have the detail so clear and yet such a nice transition of colours - drab but not drab if you see what I mean. 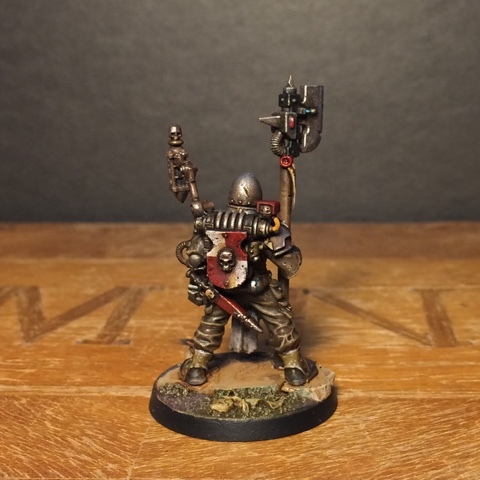 I am just about able to get a basecoat, wash and highlight sorted at the moment so I love to look through good quality photos of your minis here to give me some ideas and tips. SwagBucks is an high paying work from home website. New Blog! Get yer new blogs here!